The march down a narrowing path continues...from 167...down to 1. 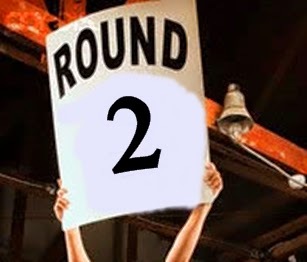 Today is the second bout of the the 3rd Round in the WRiTE CLUB playoffs -- where we will whittle the surviving list of contestants from six to four. There will be three bouts...on Mon - Wed - Fri...with our fighters randomly re-matched using their submissions from round two. Once again, we will have outright winners for each bout and one wildcard (the loser with the most votes), so every vote counts! How are those winners chosen? By you. Anyone can vote by simply leaving the name of the writer who resonates with you the most in the comments below. After you do that, please spread the word so we can maximize the exposure for our contestants. The winners will be posted in the afternoon on September 14th. The winning writers who move into the quarter-finals (Monday, September 15th) will have the opportunity to "tweak" or edit their current submission based on the input voters have left for them. Those "tweaked" submissions will also be used to battle in the semi-finals, where only two will become finalist. No wildcard in the semi-finals. The two fighters who make it to the finals will be asked to submit 500 word writing samples for a 3rd time, and those new samples will be forwarded to our celebrity judges. Of course I'll post them here on my blog for you to comment on, but it will be our judges who make the final selection. If by chance our judges vote end in a tie, the votes left in the comments will be used as the deciding factor. Good luck to all of the WRiTER’s! Minnie Dorsey had wandered her way into Chicago’s world-renowned red light neighborhood, the Levee District. Rubbish littered the ground and she dodged gaping patches of the street with missing bricks. The neighborhood was quiet in the early morning: the women who worked the night through were drifting off to sleep away the traces of the men from the evening prior. She hadn’t ventured to the area before. She worried she might see folks she knew and they’d think Minnie a different sort of woman than she really was. Sure, she liked to spend time with a number of men. Sure, she enjoyed gifts and luxuries bestowed upon her by her men. But Minnie Dorsey was not a prostitute. Minnie stopped in front of one house that stood out from the rest. The lines of the building, the strong arches over the windows, and the square cupola were things her favorite fellow Benjamin would appreciate. Ben was an architect, a lover of strong lines and sturdy things. She turned away from the house; not wanting to think about Benjamin Marshall anymore. He was soon to be married to another woman, after all. A middle-aged woman approached her. “What’s a fancy-looking gal like you doing in this part of town?” the woman called. She wore a gorgeous dress, her dark hair piled atop her head. Her eyebrows were strong, her nose set low on her face. “You’ve heard of this place, have you not?” The woman dug in her handbag, producing a large bundle of keys. Her fingers were sprinkled with rings, the diamonds sparkling. “Oh, I’m not…” Minnie started, speaking too loudly, too quickly. She stopped, not wanting to offend the woman. Minnie had nothing else to do that day—she certainly wouldn’t be visiting Benjamin anymore. “I suppose a cup of tea doesn’t sound half bad.” And she followed Ada up the front steps into the best-known whorehouse in Chicago. Unless you’re a tropical plant or a cold-blooded reptile, outdoors is not a fun place to be during summer in Kansas. That’s why twelve-year-old Conley Hoss and his little brothers spent so much time in the neighborhood pool, even though it irritated them. “Cannonballs, on the count of three!” Conley stood poolside, water lapping his toes, arms windmilling. Then he made the mistake of glancing toward the deep water and one of the Pink Whales caught his eye. Sunglasses up, her gaze was red-rimmed…threatening. In the middle of the pool, a pod of middle-aged ladies sipped diet coke and flipped paperbacks on queen-sized floats. Although their skin gleamed with coconut oil, the Pink Whales never browned up. That didn’t stop them from taking over the deep end every day. “Hey guys, try not to splash.” Conley actually meant it. Beside him, his brother Wyatt snorted. Kindness wasn’t his curse. “One, two, three!” Knees tucked, the boys hit the water and plumes of spray showered the Pink Whales like tropical rain. When Conley surfaced, the ladies were shrieking and floundering like cats at sea. He smiled…guiltily, darn it. “Your parents are in so much trouble for this! You Hosses don’t belong here!” The orca-woman’s fists rocked her inflatable, then she face-flopped into the depths. Spluh-plash. Wyatt was laughing so hard he could barely keep his head above water. Keller grinned, eyes darting toward the floating riot. “Um, should we go dry off?” Conley’s third brother kicked his feet one more time, waved at the advancing Pink Whales and fled. Conley dunked Wyatt’s bobbing head and followed. Another day, another whale attack, another round of calls to his mom… Summer break was becoming a stress fracture. But as traumatic as the pool was, Conley’s neighborhood had other problems. His home in prosperous Johnson County, Kansas, had a flat lawn and beige siding, like every other house in the Eagle Mountain subdivision. Conley’s dad joked that living in a cookie-cutter home was killing their souls. His mom called their house “The Prestige” because a movie with that name involved clones. A world of clones would be lonely and in a strange way, The Prestige was lonely too. Stick-thin with unruly hair, Conley wasn’t exactly one of the cool kids, although he blamed that partly on his lack of video game skills and his crazy little brothers. They deserved a page in his favorite book, the thrilling Deadly Perils: And How to Avoid Them. But “annoying perils” would be more like it. Conley sometimes wondered why his family didn’t seem to fit in. Maybe it was because there were so many of them: four boys, counting baby James. Maybe it was because they resented their neighborhood’s deceptive name—no eagles or mountains. Or maybe it was because they thought the pool was actually for swimming. Cocktail Lion. Just not captured by Miss Drake's subject matter. Cocktail Lion is my vote! Both of these are strong entries. Miss Drake's is a well-written piece, suffering only the occasional bit of passive voice. Cocktail Lion brings humor, though I felt the piece tried to do too much. The cannonballs amongst Pink Whales and aftermath would have been enough for me. In the end, I find Miss Drake delivers a more complete piece and give her my vote. I find myself inclined to agree with Dan. I enjoyed both very much. But I, too, vote for Miss Drake. Cocktail Lion's piece is still funny. Cocktail Lion gets my vote. Miss Drake has me wanting more. A roar and a toast to Cocktail Lion. Great voice and pink lady whales too awesome to pass up. I agree with the previous comment that Cocktail Lion's piece felt like it was trying too hard to be funny. Miss Drake gets my vote. Clear, vivid, & witty writing-my "mane" reasons for casting a vote for Cocktail Lion! Cocktail Lion. I will never view the pool the same again. Miss Drake. This was a tough one though, since these two are so different it's difficult to compare them! Cocktail Lion. Funny! And did a good job presenting us with an interesting character in the 500 words. Miss Drake's offering was perhaps a bit better written in a technical sense, but that (for me) is not the be-all end-all as to how I have chosen my pick for this round. Congratulations to both these writers! You are the cream of the crop and I wish I didn't have to pick.